February 6, 2019, dearly-loved husband of Maureen, much-loved father of Nadine and partner James, Jonathan and partner Fiona and loving grandfather of Dean, Adam, Fraser, Lewis, Emily and Beth. A Service of Thanksgiving will be held in Abbots Cross Congregational Church on Monday 11th February at 2.00 p.m., followed by interment in Carnmoney Main Cemetery. 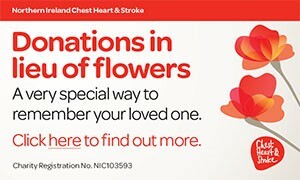 Flowers welcome or donations in lieu, if desired, to Chest, Heart & Stroke c/o Fleming & Cuthbert Funeral Directors 141 Mill Road, Ballyclare, BT39 9DZ. A smile for all, a heart of gold, one of the best this world could hold, never selfish, always kind, these are the memories you leave behind. Sadly missed. From sister Carol, husband Peter and daughter Julie. Sadly missed by nephew Uel, wife Ann, great-nieces Laura and Sarah. Deepest sympathy to niece Maureen on the death of her beloved husband Bobby and all the family circle. I am sorry to tell you that Robert (Bobby) Cooper has passed away.